Hello everyone: As you can see, the new challenge at RETRO RUBBER is a COLOR CHALLENGE. This colors are soft and pretty so you can go in a bunch of directions with them. 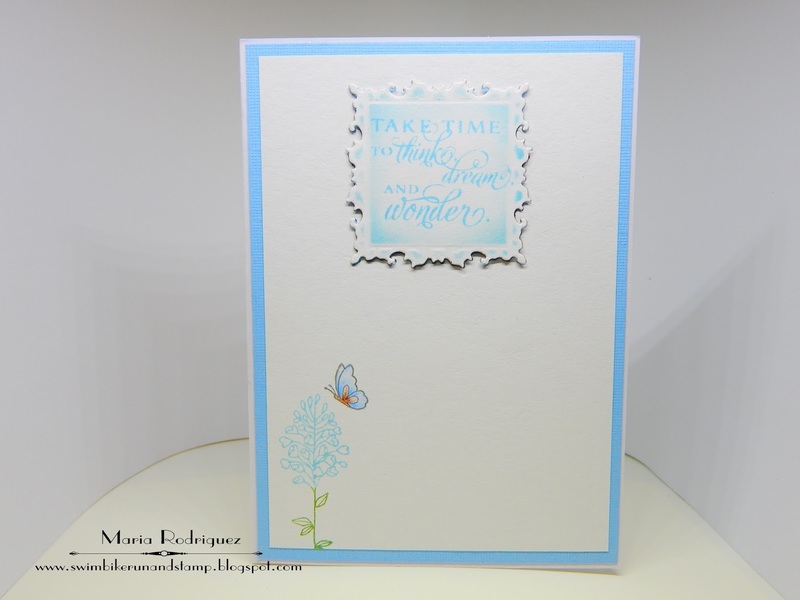 Here is my card that I hope will inspire you to join us in the gallery. For more inspiration, hop over to my teammates blogs to see the awesome projects they created. 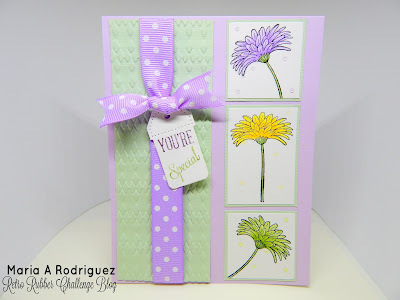 This image is from a retired 2012 stamp set called "Reason to Smile", which is one of those layering stamp sets, love this little Daisy, simple and sweet. I just stamped it onto pieces of water color paper and colored with SU markers and the aqua painter, I tried to get colors close to the challenge's color palate. The ribbon is from my stash and the sentiment from a Power Poppy set called Sassy Succulents. The sentiment is also from the Sassy Succulents set. So there you have it, so go dig out your older than one year stamp sets and join my teammates and I in the RETRO RUBBER gallery. Do not forget to read our rules, they are few but important. This time our theme is MUSIC so, dust off those old music sheet stamps, musical instruments, etc. and join us in the gallery. Here is my card, I hope it will inspire you. Two of my granddaughters play the Viola, it's truly amazing to see them on the stage with their High School and Middle School Orchestras performing. This is a very simple card, the music score is a die from Memory Box and the sentiment is from Elizabeth Crafts, both die cut with blue foil paper. 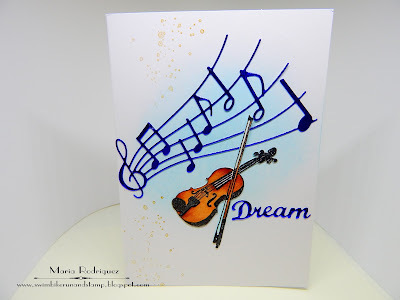 The Viola was stamped onto a piece of water color paper and colored with Prismacolor pencils then, fussy cut, the bow was so darn hard to cut, I actually ruined one of the images and I had to start over. Sentiment from a retired Flourishes set called "Orchids" and the little flower on the corner from a retired Stampin Up! set called "Flowering Fields. There is a lot more fabulous inspiration over at the SHOPPING OUR STASH blog, while there, stop by my teammates blogs to see their awesome creations.